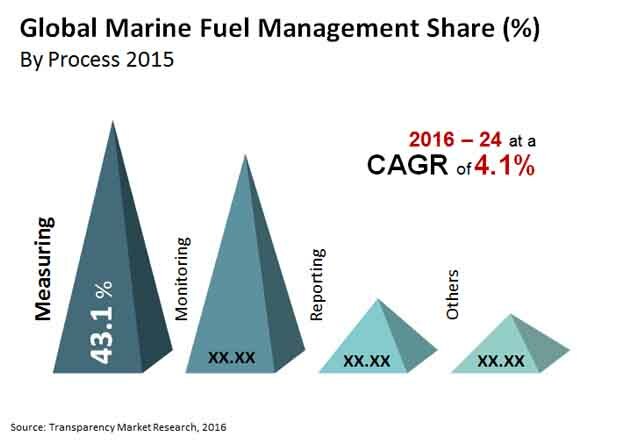 The marine fuel management market features an intensely competitive but highly fragmented landscape as the leading six players accounted for a combined share of merely 33.8% of the market in 2015, finds Transparency Market Research (TMR). These top players are-Krill Systems Inc., INTERSCHALT maritime systems GmbH, Nautical Control Solutions LP, Siemens AG, ABB Group, and Emerson. TMR observes that the entry of new players in the market is expected to alter the competitive dynamics in the coming years. Prominent players are offering advanced fuel management and monitoring systems with advanced software capabilities aimed for the commercial marine segment in order to consolidate their market shares. Several players are offering automated technology solutions that helps in effective fuel management. The global marine fuel management market was valued at US$3.8 bn in 2015 and is projected to surge to US$5.4 bn by the end of 2024. The market is anticipated to expand at a CAGR of 4.10% from 2016 to 2024. Geographically, the global marine fuel management market is segmented into Asia Pacific, North America, Europe, the Middle East and Africa, and Latin America. Of these, Asia Pacific led the market and occupied a major share in 2016. The dominance of the market is mainly attributed to the burgeoning shipbuilding activities and the replacement of old marine fuel management systems with advanced ones. The major application areas of marine fuel management system are fleet management, fuel consumption, viscosity control, efficiency level, shore side reporting, cargo delivery verification, and cross fleet standardization. Out of these, the fleet management segment has emerged as the leading application area and is expected to maintain its lead throughout the forecast period. The growth of this segment is fueled by significant demand for reliable fleet fuel management solutions to cut down on fuel costs and boost operational performance of vessels or fleets. The marine fuel management market is mainly driven by the rising cost of marine fuel, strict regulations by governments in various regions for curbing marine pollution, and the need for reducing the operational costs for ships and vessels. The total cost of marine fuel typically amounts to over half of the operating costs of fleets and vessels, hence effective management of fuel helps in enhancing operational efficiency. Marine fuel management solutions are gaining prominence as they enable fleet owners to get an accurate amount of fuel oil used at any specific vessel speed or engine rpm. The integrated approach is helpful in measuring, monitoring, and reporting fuel usage, thereby significantly improving the performance of large vessels. Furthermore, the presence of regulations in various regions limiting sulfur emissions is expected to stimulate the demand for marine fuel management solutions. The implementation of fuel management system helps fleet owners meet various regional compliance requirements. The increasing demand for marine fuel management system in monitoring the quality of fuel at the time of fueling the fleet has boosted the market. The growing application of fuel management systems in controlling fuel theft, monitoring viscosity control, and managing various cargo delivery verifications, has accentuated the market. However, declining oil prices and the structural slowdown in the oil and gas industry is expected to restrain the marine fuel management market to some extent over the next few years. Nevertheless, the advent of advanced sensor technologies and the launch of intuitive solutions are expected to unlock exciting opportunities for market players in the coming years.